Add Recombinant Histone H3.3-H4 tetramers to my shopping cart. Tetramer of 2 full length N-terminal Flag tagged recombinant histone H4 units and 2 N-terminal His tagged recombinant histone H3.3 units, produced in E. coli. Histones are the main constituents of the protein part of chromosomes of eukaryotic cells. They are rich in the amino acids arginine and lysine and have been greatly conserved during evolution. Histones pack the DNA into tight masses of chromatin. Two core histones of each class H2A, H2B, H3 and H4 assemble and are wrapped by 146 base pairs of DNA to form one octameric nucleosome. Histone tails undergo numerous post-translational modifications, which either directly or indirectly alter chromatin structure to facilitate transcriptional activation or repression or other nuclear processes. The histone variant H3.3 replaces conventional H3.1 in a wide range of nucleosomes in active genes. H3.3 constitutes the predominant form of histone H3 in non-dividing cells. 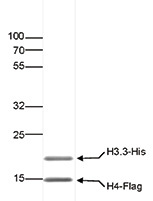 SDS page of the Recombinant Histone H3.3-H4 tetramers. The position of the protein of interest is indicated on the right; the marker (in kDa) is shown on the left. 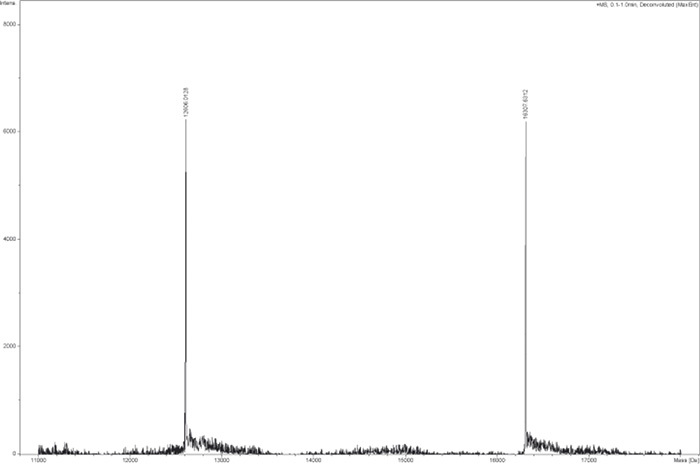 ESi-TOF analysis of the Recombinant Histone H3.3-H4 tetramers. Diagenode strongly recommends using this:	Recombinant Histone H3.3-H4 tetramers (Diagenode Cat# C23010014). Click here to copy to clipboard. Add Recombinant Histone H3 to my shopping cart. Add Recombinant Histone H4 to my shopping cart. Add Recombinant Histone H2A to my shopping cart. Add Recombinant Histone H2B to my shopping cart. Add Recombinant Histone H2A.X to my shopping cart. Add Recombinant Histone H2A.Z to my shopping cart. Add Recombinant Histone H3.3 to my shopping cart. Add Recombinant Histone H2A-H2B dimers to my shopping cart. Add Recombinant H3.1 Core Histone to my shopping cart. Add Recombinant H3.3 Core Histone to my shopping cart. Add Recombinant Histone H3.3 K27M to my shopping cart. Add Recombinant Histone H2AX-H2B dimers to my shopping cart. Add Recombinant Histone H2A.Z-H2B dimers to my shopping cart. Add Recombinant Histone H3.1 - H4 tetramers to my shopping cart.